Justin Lin is the savior mainstream action movies spent the first ten years of the new millennium searching for. Over the past two Fast & Furious films Lin has established a reputation for masterful execution of batshit insane action sequences, as well as a strong grasp on how to properly balance a handful of characters and storylines (even in the most ridiculous situations). His latest offering, Fast & Furious 6, is no different. In fact, it just may be his best work to date. No one walking into a Fast & Furious film at this point is doing so in hopes of finding high brow entertainment that methodically blends moments of comedic lightheartedness with engaging conversation filled with poignant observation about this craziness we call life. No, these are the kinds of movies you see when you want to escape all the nonsense of the real world. They’re a safe haven for the electronically inclined that frees you of the worries you carry throughout the work week. If that describes what you’re looking for at the box office right now, then Fast & Furious 6 is the equivalent of Christmas arriving early. When we last left Dominic Toretto (Vin Diesel) and crew they were fleeing Rio after one of the most absurd bank robberies ever brought to the silver screen. At the top of Furious 6, which is the title Lin originally wanted to use, the gang has gone their separate ways and settled down in various ideal locales around the world. They think everything has finally calmed down, but it’s a sense of peace that is as fleeting as can be. Shortly after the birth of Brian’s (Paul Walker) first child, agent Hobbs (The Rock) arrives at Toretto’s door with a photo of Letty, whom everyone thought to be dead. He explains that the image he’s holding is recent, and that if Dom wants to see her again he’ll have to join forces with the feds to take down a gang of criminals who use precision driving skills to help carry out their crimes. Dom doesn’t hesitate, of course, and soon our cast of misfits are brought back together in Europe to begin tracking down their (assumed) fallen comrade. If Fast Five was Justin Lin fully realizing the possibilities of putting these characters in larger-than-life situations, Fast & Furious 6 is a celebration of just how big those situations can be. From the opening scene involving Dom and Brian racing through winding mountain roads, to the epic airplane sequence teased in all the trailers, Lin and script writer Chris Morgan find at least half a dozen excuses to cause utter chaos for the sake of entertainment value. Each one is extremely different, even if they (mostly) all involve cars being driven dangerously, and I challenge anyone to make it through the final two sequences without wanting to jump out of their chairs and applaud in a testosterone-fueled daze of pure joy and stimulation. Your heart will race, your muscles will feel tense, and somewhere in the middle of it all you’ll realize that you’ve actually managed to fall in love with these characters. The action is cool, sure, but beyond that Lin has actually managed to forge a relationship between the characters and viewers in a series that was thought dead before he came on board. If that isn’t the sign of true talent, I don’t know what is. If you had told me in 2001 that I would still be talking about the shenanigans of Dominic Toretto, let alone gushing about them at length, I would have thought you were crazy. 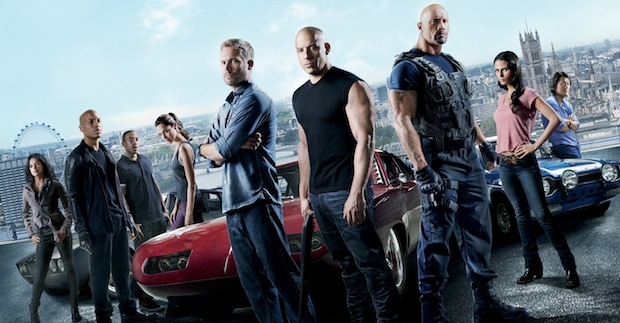 No one could have guessed The Fast & The Furious would spawn a decade-plus running franchise that only got better with age, but here we are twelve years later and sure enough the greatest installment is just now hitting theaters. Justin Lin entered a near-dead franchise two films back and found a way to weave a believable and exciting mythology through each installment that as far as I can tell shows no signs of stopping anytime soon. If you ask me, that’s the best news to come out of studios’ addiction to sequels in years, and I look forward to reviewing Fast & Furious 7 this time next year.